In architecture a corbel or console is a structural piece of stone, wood or metal jutting from a wall to carry a superincumbent weight, a type of bracket. A corbel is a solid piece of material in the wall, whereas a console is a piece applied to the structure. A piece of timber projecting in the same way was called a "tassel" or a "bragger" in the UK. The technique of corbelling, where rows of corbels deeply keyed inside a wall support a projecting wall or parapet, has been used since Neolithic, or New Stone Age, times. It is common in Medieval architecture and in the Scottish baronial style as well as in the Classical architectural vocabulary, such as the modillions of a Corinthian cornice and in ancient Chinese architecture. In modern chimney construction, a corbel table is constructed on the inside of a flue in the form of a concrete ring beam supported by a range of corbels. 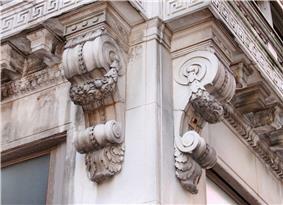 The corbels can be either in-situ or pre-cast concrete. The corbel tables described here are built at approximately ten metre intervals to ensure stability of the barrel of refractory bricks constructed thereon. 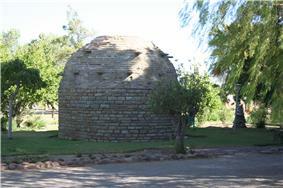 A corbelled house in the Northern Cape, South Africa built by Trekboers in the early 1800s.